Bach’s Cello Suites are considered to be among the most profound of all classical music works. 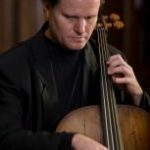 This concert will engage multiple senses with cellist Ken Kulosa performing three of the six suites, complemented by live painting and dancers from The Big Muddy Dance Company. Choreographed by Samuel Asher Kunzman and presented in collaboration with the Saint Louis Art Museum. Tickets: $20 General Admission ($15 members). Please use the code SLAMBACH18 for the member price. Tickets may also be purchased in person at the Saint Louis Art Museum’s Information Centers with no service charge.